Tonight I won the Apple Pencil lottery at my local Apple Store. I made the two-hour drive over to New Orleans to pick up an iPad Pro that I’d ordered online for Personal Pickup in store, half because I wanted avoid shipping delays and half because I want to take a chance on iPad Pro accessories being in stock. That paid off thanks to some dumb luck, and now I’ve officially had some hands-on time with the iPad Pro’s digital stylus. Apple Pencil currently shows 4-5 week wait times for delivery when ordering on Apple.com, and the Specialist that greeted me and called up my iPad Pro pickup reaffirmed that there were no Apple Pencils or Smart Keyboards in stock. While it turns out he was only half right, he added that the iPads arrived early and that the accessories were still catching up (this seems to be the standard explainer for the moment). I usually skip the Personal Setup process, but I was shopping alone this evening in no rush and said okay to take advantage of the Wi-Fi. After getting to the Home screen on my iPad Pro (wow is it big! ), I decided to browse the accessories walls and noticed the iPad Pro Smart Cover and Protective Case was available, but only in white and not the darker charcoal gray option. A second Specialist approached me once again as I was heading out and asked if I needed any help. I said sure and mentioned that I noticed the iPad Pro cases were available in white, but wondered if the darker colors were in stock. 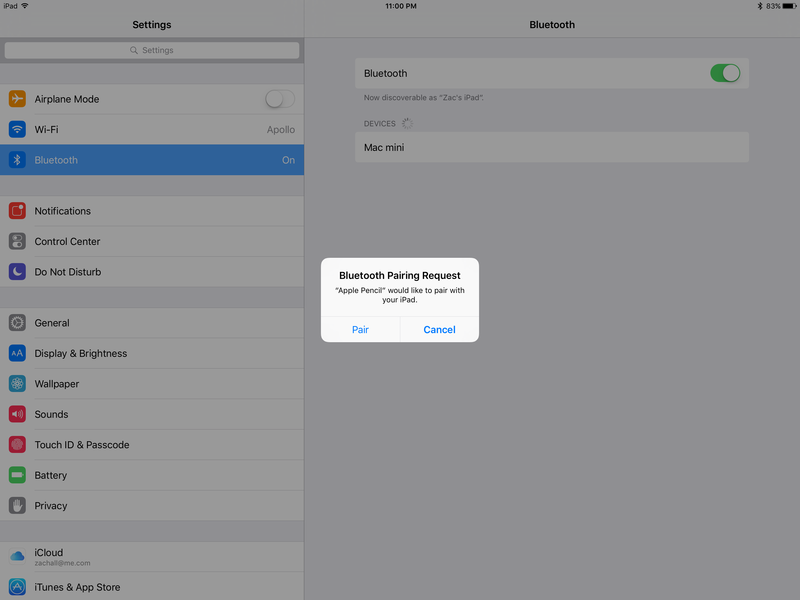 He checked his inventory on his device and said they should be available, but reaffirmed that the Apple Pencil and Smart Keyboard would not be. When he went to call out the charcoal gray iPad accessories, he noticed that his inventory indeed said not one but two Apple Pencils were stocked. I mentioned that I’d definitely buy one if they were actually there, so he requested from the back and sure enough it had just arrived around 7:30 on a Friday night. There were only two that arrived, and I’m pretty sure the other one will end up as his before the night is over. 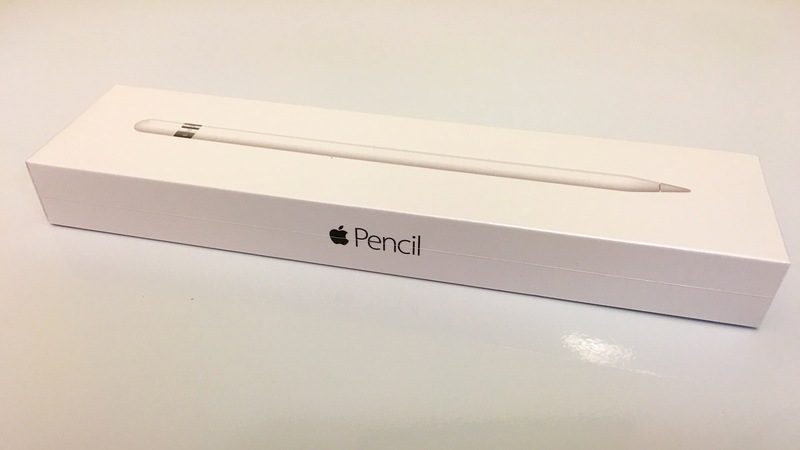 Okay, now for a few observations on unboxing and using the Apple Pencil with an iPad Pro. The packaging is rather unremarkable. 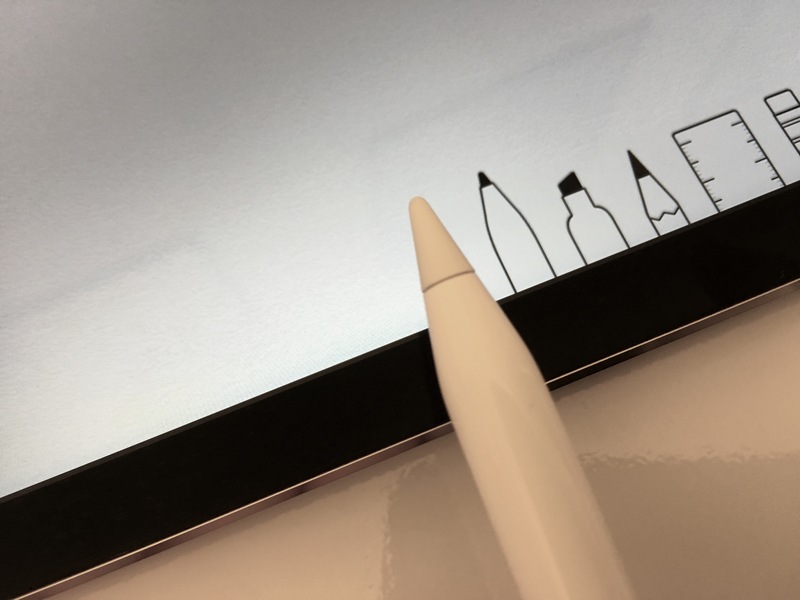 Apple Pencil is serialized with the number listed on the back label, the contents slide out from the side, and there’s a pull tab underneath the plastic to help you unbox it. 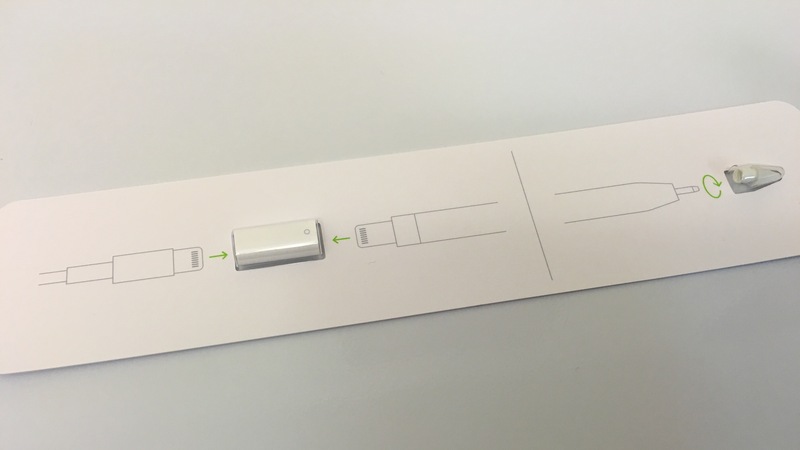 Next to the pull tab is an illustration showing you how to quickly charge Apple Pencil. 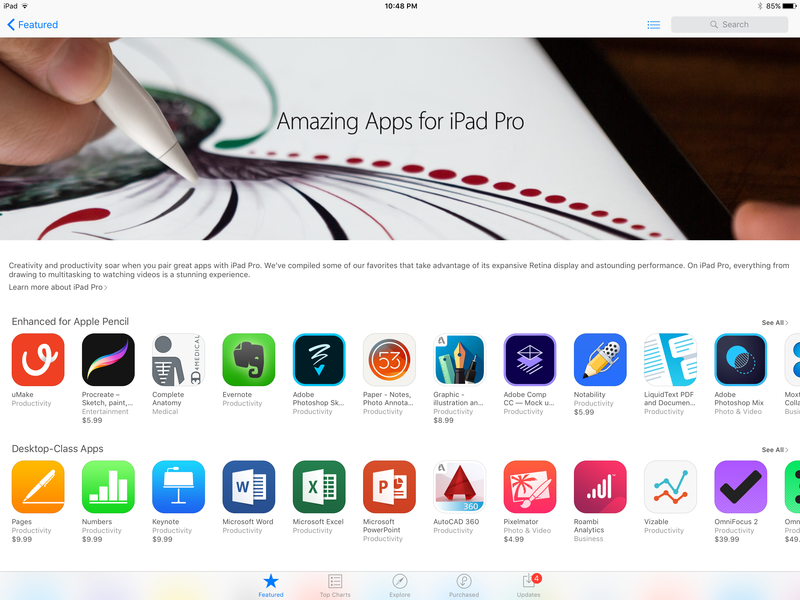 In retrospect, this is also likely showing you how to pair Apple Pencil to iPad Pro as well. Holding a warranty pamphlet and some care instructions is a sleeve marked with Designed by Apple in California. The warranty pamphlet explains the standard Apple One Year Limited Warranty – Accessory – For Apple and Beats Branded Product Only. 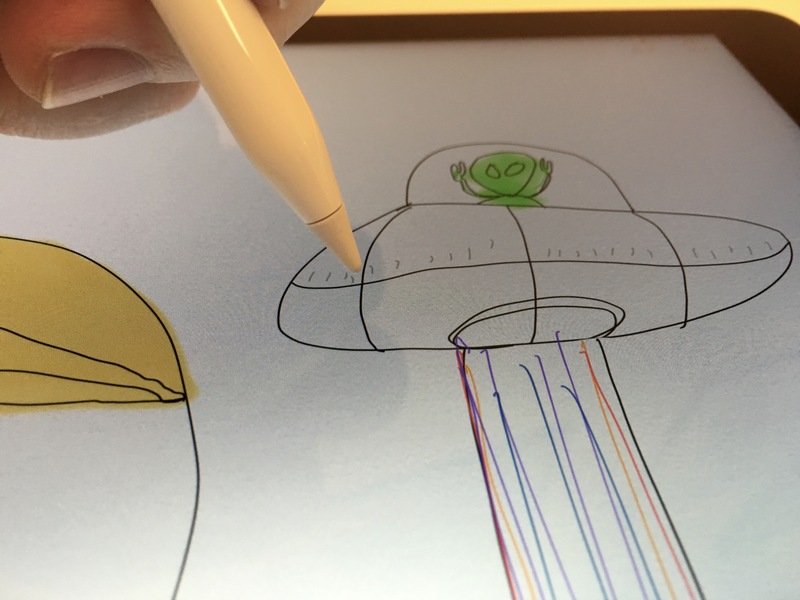 The instruction say to draw with Apple Pencil and iPad Pro as you would with pencil and paper. Interestingly, the pamphlet says that the tip will eventually wear away and need replacing to avoid damaging the iPad Pro display. A spare tip and a Lighting port adapter for recharging with a cable is included, but no spare Lightning connector cover. 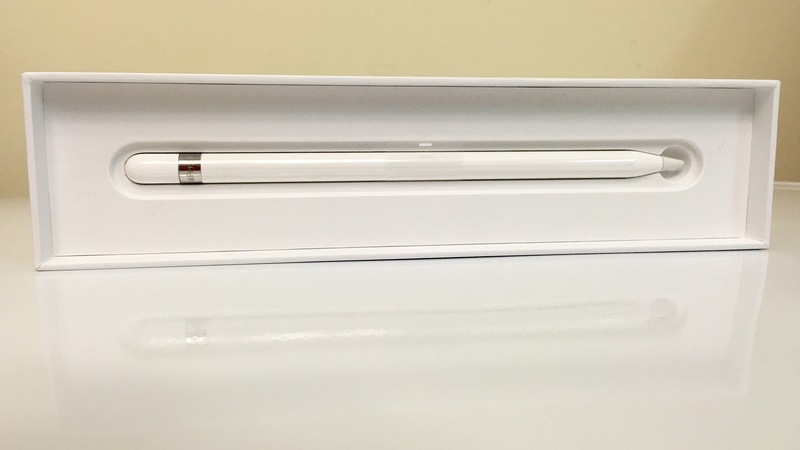 The Apple Pencil itself is laid out in a tray similar to the security-free units on display at Apple Stores. It’s also wrapped in plastic like every other Apple device you’ll unbox this year. The setup process isn’t obvious as there are no written instructions within the box that I could find. Taking a cue from Apple’s latest Magic peripherals for the Mac, I guessed correctly that removing the cap on the would-be eraser end and connecting it to the iPad Pro’s Lighting port would initiate pairing. 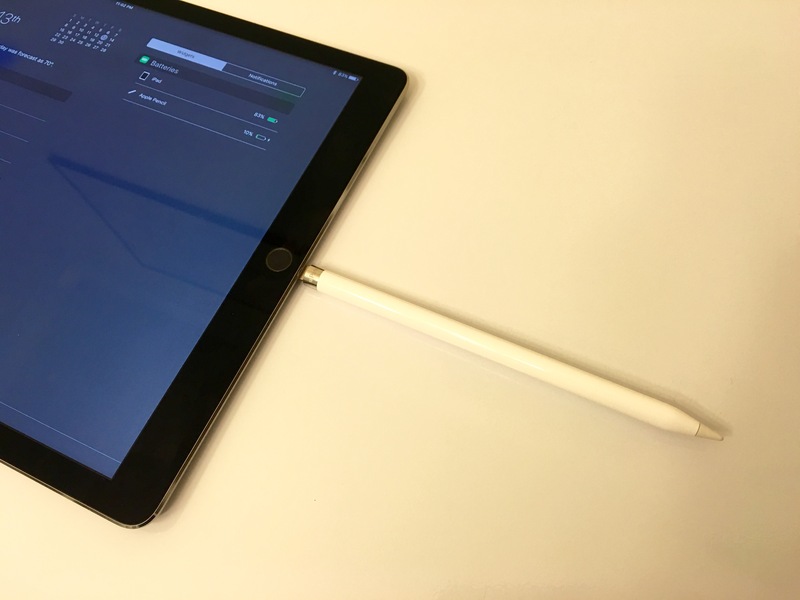 Once paired, I was surprised to receive a warning that Apple Pencil had 0% battery and needed charging. Not immediately aware of how to check the battery life and charging status, I remembered that iOS 9 added a new battery widget in Notification Center. By default, the battery widget is enabled but only visible in Notification Center positioned landscape when the “Widgets” section is enabled. By the time I found the battery widget, Apple Pencil had reached 4%; 15 minutes later it was nearly 25% charged. 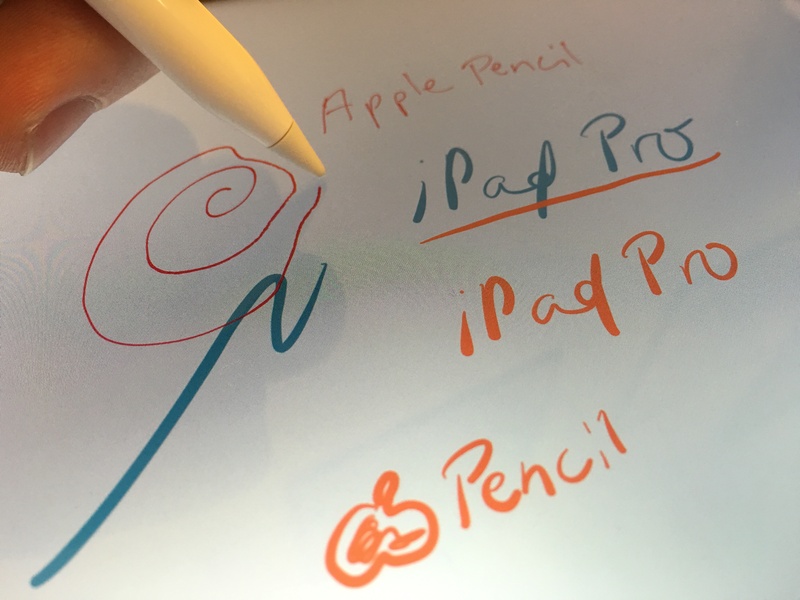 Apple’s new Notes app on iOS 9 is a great place to start testing Apple Pencil once it’s set up, but the App Store has a collection of Apple Pencil-ready apps like Procreate and Paper by 53 featured prominently at the moment. I downloaded a few, then jumped into Apple Notes to try out the built-in experience. Sketching features in Apple Notes are pretty basic compared to dedicated drawing apps on the iPad, but it’s a good start when test driving Apple Pencil. The usually odd paper-like background feels okay here, and I quickly decided that Apple Pencil’s palm rejection matched with the iPad Pro’s gigantic display make drawing on the iPad actually frustration-free and pretty simple for the first time ever. I’ve always been disappointed with the drawing experience on past iPads; the display just feels cramped and more restricting than actual paper. Apple Pencil and iPad Pro fixes that. I foresee myself really enjoying casually sketching on this device without a doubt. 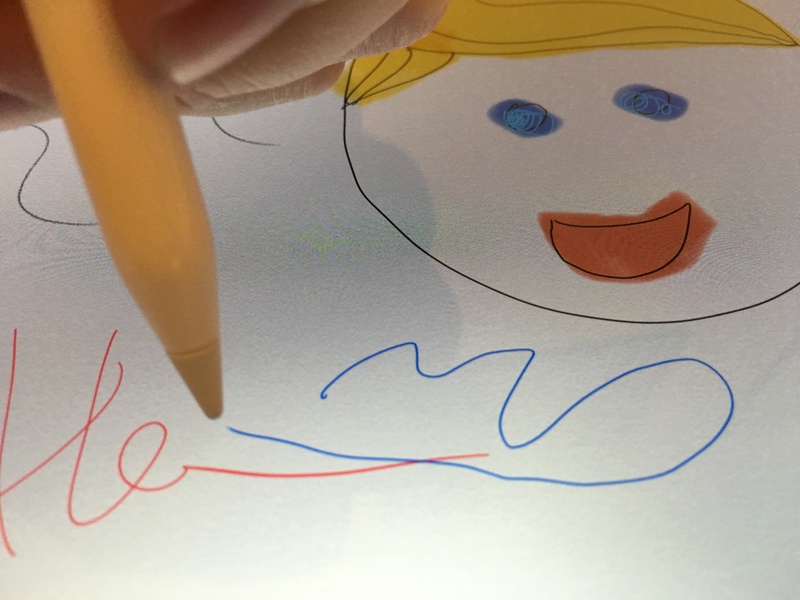 While the claim of “virtually no lag” may not ring true exactly especially in some non-Apple apps that claim to be Apple Pencil-optimized, seeing any lag with casual drawing required intentionally racing the ink hitting the paper and the Apple Pencil moving across the display.